A breeder, is a breeder, is a breeder, right? As a matter of fact, breeding dogs is a highly scientific endeavor that requires both extensive knowledge of genetics and deep integrity. Without these two major components, dog breeding has become one of the easiest and fastest ways to make a quick buck. Let’s start by defining types of dog breeders. Ethical or reputable breeders demonstrate knowledge of their breed’s history, genetics, traits, temperament and conformation. They have years of experience with the breed and abide by their breed club Code of Ethics. They have a great passion for their breed and show their dogs to championship levels to represent the standards and improve the quality of the line. Ethical breeders know about genetics to the extent that they perform required genetic testing. Different breeds are susceptible to different problems; eyes, heart, hips, skin and they test and get certified accordingly to improve the quality of their bloodlines. An ethical dog breeder is willing to disclose any problems or defects in their line and submit any data about their dogs, puppies to the AKC or their breed club. Ethical dog breeders are relentlessly committed to finding their pups a good home. If you’re a potential buyer, and haven’t faced a barrage of questions about your home, family, habits, yard, lifestyle, work hours and more, chances are you’re dealing with a backyard breeder or worse, a puppy mill. Ethical breeders care deeply about their dogs and even require new owners to agree that if the pup doesn’t work out for any reason at any time, it will be returned to them. An ethical breeder will have their pups checked by a veterinarian before they go their new homes and will provide a full lifetime guarantee, covering genetic disease and temperament problems. 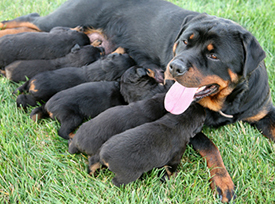 Reputable breeders offer guidance and advice to buyers for the lifetime of the dogs. They are not in it for the money, as most of the capital goes right back in to the breeding program, paying for genetic testing, showing, vet bills, and so on. A backyard breeder is a slang term for a casual dog breeder that breeds dogs for fun and money. A step above a puppy mill, these breeders are not particularly educated about the breed, history, traits, temperament or conformation. They do not even know that a Code of Ethics exists—and if they did, they would not be breeding. They do not show their dogs and are not concerned with improving the quality of their bloodline. They’ll breed poor quality dogs that don’t meet the standards of the breed. Be aware that AKC (the American Kennel Club) is a registration organization and is not equipped to monitor or screen breeders or their dogs. Anyone can have an AKC registered dog. For example, if I have a registered Golden Retriever, and you have a registered Golden Retriever, we can breed our dogs and sell them as AKC registered puppies. However, neither of us has any knowledge as to their genetic history, disease, temperament, and so on. We could then quite possibly breed pups that will develop hip dysplasia, heart disease, eye problems, auto-immune disease, and more. Since backyard breeders are mostly in it for the money, they don’t spend it on showing, temperament testing or vet bills. Backyard dog breeders rarely do any testing beyond the parents, a far cry from testing for three to five (and more) generations back which is how knowledge of their line and pedigree is developed and confirmed. They will not disclose anything, as most do not know what to disclose, having no knowledge of the history of their line. Screening potential buyers is the last thing a backyard breeder is worried about. Some will ask a few questions, but most are just happy to have you come, purchase a pup and be on your way. Even unsuitable potential buyers aren’t turned down. Backyard breeders are notorious for selling puppies that are far too young so that they do not have to pay for food once the pups have been weaned. If you are allowed to pick up your puppy before it is eight weeks old you can be certain you are purchasing from a backyard breeder. Ethical breeders will not allow their dogs to go to a new home before eight weeks of age; most won’t let them go sooner than 10 weeks. Backyard breeders provide no guarantees and their pups will not have been checked by a veterinarian prior to your purchase. You might get a bit of advice, but take it with a grain of salt as their knowledge is lacking other than on a very general level. Puppy mills are the lowest rung on the breeding ladder. These puppy factories keep animals in shockingly poor conditions, feed sub-standard food, and provide no love, comfort, toys or companionship. Despite efforts to shut them down, puppy mills continue to thrive because people keep buying puppies from pet stores or legitimate-looking web sites. Puppies are cute—but puppy mills are cruel and contribute greatly to animal suffering and overpopulation. Be aware of Designer Mutts—the Labradoodles, Goldendoodles, Pugles, Cavapoos, and so on. Years ago, if my Labrador bred with your Poodle, we wouldn’t be able to give them away. Today, they are called Designer Mutts and can be purchased for the amazing sum of $2500 to $5000. As cute as they are, when you purchase a designer dog, you contribute to the craze of poorly bred dogs, unethical dog breeding and furthering an unrealistic market. I encourage you to do your homework and purchase responsibly. If you can, go to your local shelter and adopt a dog. • Backyard breeders are responsible for 2/3 of the dogs for adoption in shelters. 1/3 of these dogs are purebreds. • AKC (American Kennel Club) is a registry just like the DMV is. Just because my car is registered with the DMV, it does not guarantee the quality of my car. AKC registration does not assure the quality of a dog. • CKC (Continental Kennel Club) is puppy mill registry and has no standards or regulations. • There are between 4,000 and 6,000 animal shelters in the United States. • Average numbers of litters a fertile dog can produce in one year is two. • Average number of puppies in a letter is 6-10. Huge numbers of dogs are being bred irresponsibly, solely for the money. No wonder our shelters are full and so many dogs are euthanized each and every year. Choose wisely.